The assembly of the Eight Medicine Buddhas depicts the image of Bhaisajyaguru, the Medicine Guru, surrounded by his 'six brothers' and Shakyamuni Buddha. 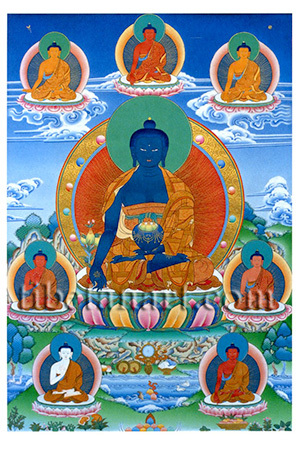 All eight of these figures wear the three monastic robes and sit in vajra-posture upon a moon disc and lotus, with only their specific colours and right hand gestures differentiating them. Bhaisajyaguru, who is also known as the 'King of vaidurya light', appears at the centre. He is radiant blue in colour and holds a stem of the medicinal myrobalan plant with his right hand, while with his left hand he holds an alms-bowl of blue beryl (vaidurya) gemstone that contains three myrobalan fruits. At the top centre is red Shakyamuni Buddha, with his right hand making the 'earth-witness' gesture. Bhaisajyaguru's 'six brothers' are: (1) golden-yellow Suparikiritita-nama-sri-raja (top left); (2) golden-yellow Svaraghosa-raja (top right); (3) red Suvarna-bhadra-vimala (mid left); (4) pink Asokottama-sri (mid right); (5) white Dharmakirti-sagara-ghosa (bottom left), (6) red Abhijna-raja (bottom right). Various auspicious offerings, jewels, trees and medicinal herbs appear in the lower landscape of this thangka.